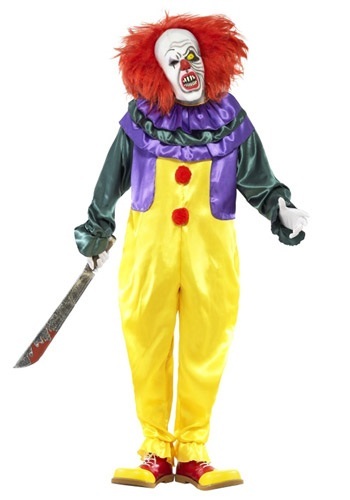 On the list of the most terrifying things in the known universe, it is surprising how high coulrophobia ranks. But, clowns? Really? They rank above demonic possession, being buried alive, talking to your mother about puberty, and even wasps. How is anything more scary than wasps!? (Well, technically they rank below needles—but we all expected that!) How did it even come to this? Clowns are entertainers. Joke-tellers. Balloon-benders. Nothing about it to be worried. So, channel all of your terrifying energy into this Classic Horror Clown costume and prepare to wreak havoc on the innocent minds of anyone who hadn’t previously considered clowns to be anything but goofy. Begin with a bright and friendly yellow jumpsuit with green and purple sleeves and vest. Note the bright and engaging red hair, too. Next is your purple and green ruffle collar and the fuzzy red pom poms that give you as goofy and adorable a look imaginable. And, the last bit—your makeup! Don the … horrifying terror mask of doom and your clown has instantly transformed into a demonic terror! You have fun now!